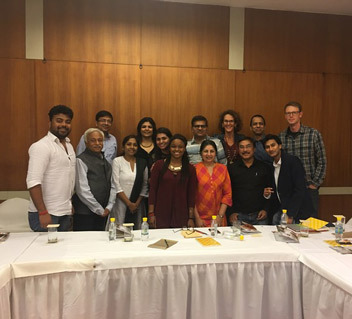 Travis Wilson and Jessica Honegger, the Founders and co-CEOs of Noonday Collection, recently traveled to India and meet with our artisan business partners. They traveled across the country to connect with artisans whose lives are being changed through dignified work. Travis took a break from the busy holiday season to have a conversation with Katie McCauley, Noonday’s Community Manager, about his exciting journey to India. Katie: Welcome back, Travis! Can you tell us about India and why it’s so important to Noonday? Travis: Thanks, it’s good to be back. I always enjoy being back in the office during the peak holiday season—the office is buzzing with activity and this is when Noonday shines. India was great. It is as diverse as it is large, with over one billion people! In 2014, four out of every ten pieces that Noonday has sold have come from India, making India our largest supplier country. India is a country of both great need and great opportunity. This trip confirmed our view that it will be a strategic focus for us in the coming years. We’re excited to provide Noonday’s beautiful fair trade products to a growing and passionate customer base that seeks to impact the lives of people living in some of the most vulnerable communities across the globe. 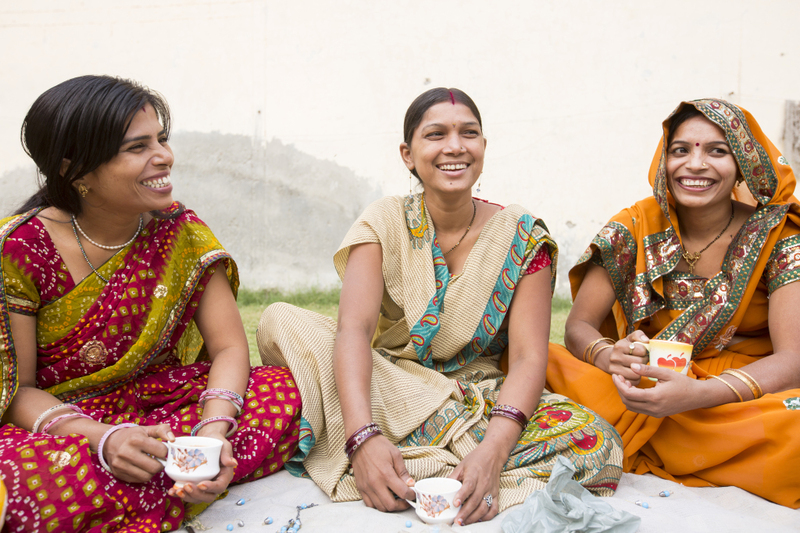 Can you tell us more about the artisan businesses we partner with in India? We work with a sprawling network of artisan businesses throughout the country. We were hosted in Delhi by one of our strategic partners in India. They play the important role of connecting small artisan groups to international buyers. The first place Jessica and I visited was a village where most of our glass beads are made. Every bead is made out of recycled glass that is melted down and then shaped by a wooden casting that is pressed by hand or by hand spinning. As we watched this production process unfold in front of our eyes, it became so clear to us that the story of this craft is a story we want to do a much better job of telling. It is incredible to see and understand. It makes every finished piece so much more special to know the craftsmanship that goes into every little bead. What surprised you as you met the Artisans who create jewelry for Noonday? It was interesting learn about the Artisans’ religion. Religion plays a very strong role in India and nearly 80% of the country identifies as Hindu. It was fascinating to discover that while less than 15% of the country is Muslim, at least 50% of the Artisans who create our products come from this Muslim minority. Muslims are known throughout the country for their artisanal skills. Muslim people have played an important role in the country throughout the centuries with their talents—the Taj Mahal is the most notable example of this. Additionally, Muslims represent an often-persecuted minority in the country and have not had as many opportunities for social and economic advancement. As a result, many rely upon their artisanal skills to make a living. My favorite detail about your trip is learning about the rich legacy that is being preserved by these artisan businesses. Can you share more about that? Absolutely. There are many countries where Noonday’s work is primarily a vehicle for job creation. While this is true in India as well, it is also very true that Noonday’s work is enabling many rural and tribal communities to continue artisan techniques that have been passed down through generations. Some of the work that we witnessed has been passed down through centuries and is still a major part of their culture to this day. I was impressed to learn that the Indian government is passing policies to support and encourage tribal handicrafts throughout the country. Because handicrafts can be done in rural areas, this policy is aimed at preventing over-migration to urban centers by rural-dwellers in search of work. Did you and Jessica have the opportunity to visit artisan businesses outside New Delhi? We had an amazing visit with a new group in Orissa, an Indian state that is known for being extremely poor. After arriving from Delhi, we drove about three hours to reach a village where one of our artisan partner groups works. When we stepped out onto the village road, it felt like we were in another world. We walked around this small community and heard “clink, clink, clink” from all sides. It was all the artisans making beads—definitely a moment from the trip I will remember. Noonday is the first international buyer for this group, which is huge for them. We’re really excited about the potential of this group and the opportunity there is to make an impact. Most of the artisans in this one group are young women: about twenty women total, ages 18-25 with a few women in their late 30’s. Jessica loved the women’s style and joked with them that India was the home of the original “arm party,” which they loved. After visiting with those women for a bit, we walked around the village and watched them make the beads that we had heard when we first arrived. Both men and women were involved in making them, and each bead took so much time. Each one really is made with great care and attention. After the beads were complete, they were passed to a group of younger men who were part of the assembling process. Everything in that village was truly centered around making handicrafts, and it was fascinating to see so many of our new Spring pieces in the process of being made. 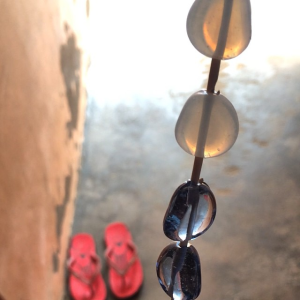 Any moments in India that reminded you why you joined Jessica in getting Noonday off the ground? There were so many of these moments, but I’ll give you just one. When we were in Orissa, we drove to a second village about an hour away to visit another one of the groups that is part of the association we are now working with. When we arrived we found about forty women working in the downstairs of a large building, creating our Spring pieces. It was an enormous building, and they weren’t even close to filling it up to capacity with their current numbers. After spending some time with them and really getting to know them—and these women getting to know us—they had huge smiles and were saying, “Next time you come back, there will be 100 more women!” I share their excitement and nothing would make me happier than helping make their dream a reality. Thank you Travis and Katie for this fascinating glimpse into Noonday’s work in India! When you shop Noonday Collection, you join our movement of social entrepreneurs who are creating jobs for artisans across the globe! Thank you for using your purchasing power for good, opening your home to host a Trunk Show, or advocating for these artisans as an Ambassador. We couldn’t do it without all of you! As Noonday’s Community Manager, Katie is passionate about fostering sisterhood and connection amongst our Ambassador community. Her favorite parts of her job include being a friend matchmaker and equipping women to be confident business owners. Outside of work, you’ll find Katie camped out somewhere with a patio and sunshine, going to concerts, and spending one-on-one time with her favorite people.